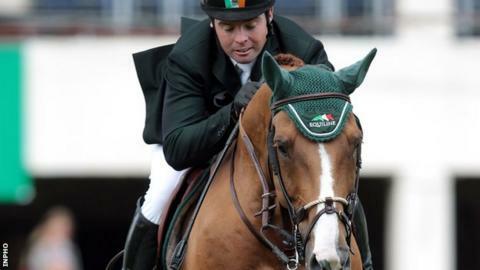 Irish show jumper Cian O'Connor will have the opportunity to battle for Olympic glory in London some seven years after being stripped of the Athens gold medal. O'Connor has been handed an unexpected late call-up after Denis Lynch was dropped by the Ireland selectors. Lynch's horse Lantinus was disqualified at the recent Aachen Show after being found to be hypersensitive. O'Connor's horse Waterford Crystal failed a drugs test at the 2004 Games. However, he was stripped of the gold medal in March 2005 by the sport's international governing body. Ireland will now be represented in London by O'Connor, who will partner Blue Loyd 12, and Billy Twomey on Tinka's Serenade. Lynch was one of four show jumpers suspended from the Beijing Olympics in 2008 after their horses tested positive for capsaicin, a derivative of chilli peppers, banned for its hypersensitising and pain-relieving properties. Hypersensitivity can give a horse an unfair advantage in show jumping competition and the International Federation for Equestrian Sports tests for the artificial production of the condition. Lynch said in a statement over the weekend that his horse's condition was naturally occurring. However, Horse Sport Ireland's monitoring committee was not satisfied by Lynch's explanation for why the Lantinus was disqualified from the remainder of the Aachen Show after competing in the Nations Cup. Lynch was free to continue competing at the show and finished 13th on his intended London horse Abbervail van het Dingeshof at Sunday's Grand Prix. Horse Sport Ireland's Damian McDonald said that the body had been forced to take "a very hard decision". He added the decision had been taken because it was the third time in 12 months that one of Lynch's horses had tested hypersensitive. O'Connor competed alongside Lynch for Ireland at the Aachen Nations Cup and performed well on his Olympic mount with a four faults and clear round.